Please return soon, thank you for your patience. 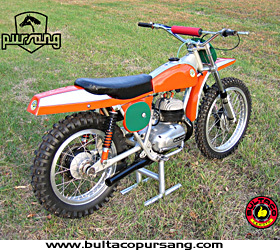 Ordering from the Bultaco Pursang Online Store is easy! Simply choose the items you wish to purchase and add them, individually, to your shopping cart. You can edit the quantities at any time easily adding or deleting items. You can view the contents of your cart with a total dollar amount when you click on the checkout button. When you are ready to complete your order, confirm totals and proceed to the secure checkout area.